The hunt has begun! Come and get your pirate on!! Hint: It’s a box inside a box, but you’ll have to go upstairs to find it. Happy hunting! The Skull n Bones Hunt is about to start, and for this event I made a versatile outfit for classic and mesh avatars – Brass Rose Pirate. It includes a tricorn hat, jacket with Omega appliers, optional puffy sleeves and shoulders, pants with flat thigh boots in mesh, fitmesh, Belleza, Maitreya and Original Slink sizes. Also included is a pair of matching trousers w/ Omega applier so you can opt to wear your own boots instead. My current favorite outfit is the jacket & leggings with black leather thigh high boots and eye patch. 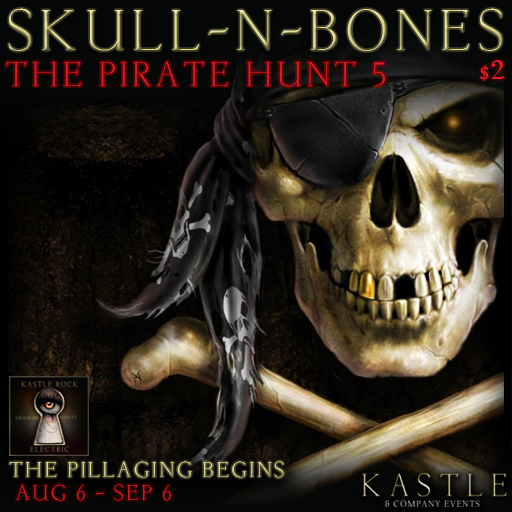 The hunt starts on Sunday, to get ready to start pillaging.